WHY SHOULD YOU GROW YOUR OWN FRUIT? - It is easy and fun to do! - It is healthier for your family than eating commercial and imported fruit that is often laden with chemicals. - Fresh fruit is important for a healthy diet and in the prevention of cancer, heart disease, and obesity. - Fresh fruit tastes better and has more nutrients and antioxidants when picked ripe from the tree. - You can grow your own fruit without pesticides. - It is cheaper than buying expensive fruit at the store. - You can grow a lot of fruit with just a few trees or in a small space. - You can make money selling the fruit and receive tax deductions for your expenses and tax exemptions for your land. - You improve the soil and the earth. - You provide food for birds and wildlife. - You promote locally grown food and increase your independence. - You save fossil fuels and reduce your carbon footprint. Growing fruit in your own backyard or orchard is an easy, fun, and healthy alternative to buying fruit from the store. Fruit harvested fresh from the tree tastes better and is much healthier than imported fruit from the grocery store. An orchard can be a profitable backyard business where you can harvest and sell your crops to make extra money and get agricultural tax exemptions for your land. Edible landscaping is the hottest new trend in gardening, and you can produce an amazing quantity of fruit in a small space. Even only a small patio, you can grow many kinds of perennial small fruits and berries. With the correct selection of varieties, can have fresh fruit ripening at your home throughout much of the year. One of the greatest joys in gardening is harvesting fruit from your own trees! Growing your own orchard is easy. It does not require lots of space. A few trees can provide you with hundreds of fresh apples, peaches or persimmons to eat each year. Some fruit plants, such as blueberries, can even be grown in pots on a patio. Many kinds of trees start to bear in the first couple of years, so you don't have to wait a long time before the first harvest. Commercially grown fruit has to be picture perfect and spotless to sell to a grocery store. It is treated with many toxic pesticides and chemicals and is picked green so it ships better without bruising. In your own orchard, you pick the fruit when it is ripe and its flavor is at its peak. If the fruit has some blemishes they can be cut out before eating or cooking. Despite what many think, you do not have to use lots of sprays or chemicals to be successful in growing your own fruit. In our orchards we use little to no chemicals at all. 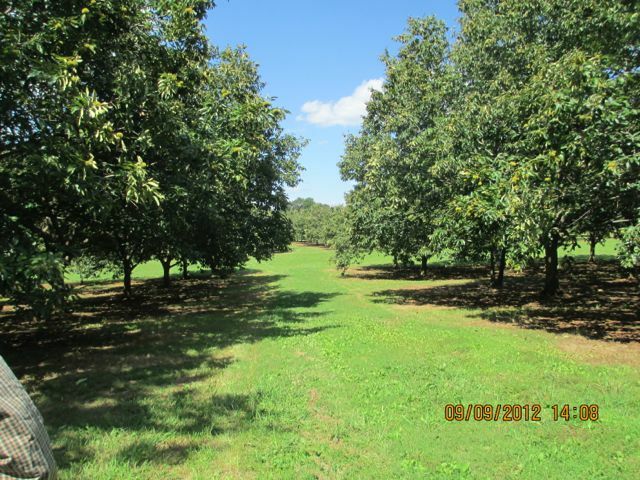 Orcharding can be a profitable business for a small farm. A few acres of trees can produce thousands of pounds of fruit which can be sold at farmers markets or roadside stands at high retail prices. Organic fruit brings even higher prices! Not only can this become a good additional source of income in these challenging economic times, but you can also receive tax deductions for orchard expenses (such as writing off your tractor or vehicle to take the produce to market) and receive an agricultural tax exemption for your property taxes (please consult your CPA or local tax office for details). Growing your own fruit also provides many other benefits beyond giving healthy food for your family and income from your land. Working outdoors is healthy and good exercise for you and your children. It helps mend the soil, creates a local economy of food grown in rhythm with the cycles of the earth, and provides food for wildlife and birds as well as yourself. You become less dependent on fossil fuels and the food distribution system, and you become a carbon sink by planting trees, offsetting the carbon you do produce. It is a healthier lifestyle for your family and for the planet. "In olden times there were warriors, farmers, craftsmen and merchants. Agriculture was said to be closer to the source of things than trade or manufacturing, and the farmer was said to be "the cupbearer of the gods". He was always able to get by somehow or other and have enough to eat." The process of growing your own fruit is an amazing learning experience! You begin by understanding of your local climate and soil and what is adapted to your area. Learning what kinds of trees are native to your area will tell you what you can grow successfully. The next step is learning the basic process of how to grow - planting, pruning, fertilization, watering and pest control. You must be aware of the changing weather and seasons to manage the growth in the face of changing conditions such as a dry summer or late frosts. Each season has its own care requirements, unique for each type of tree you grow, such as winter pruning techniques, spring fertilization, summer fruit thinning and fall harvest. The knowledge of how wildlife and insects interact with each particular plant, who eats what at what time of year, is also important. It is fascinating to understand the cycles of your local ecosystem and will increase your appreciation of the birds and wildlife in your area and how they lead their lives. Propagation is another fascinating dimension of growing plants. Every species has its own particular requirements from seed germination, rooting cuttings or the art of budding and grafting. Finally, there is the thrill of creating new varieties, such as those selected by our grandfather, Dr. Robert Dunstan. The process of making controlled pollination crosses, the planting of the seeds produced, and growing them to fruiting can take up to 10 or more years just to judge the results. There is truly a lifetime of learning involved in growing your own orchard. We look forward helping you be successful in your efforts!